The wonderful thing about books is that they can have second, third, and multiple lives. They can be reprinted, put into different formats, and made into movies (every writer's dream!). Leora Skolkin-Smith's Edges has just been reissued, and the timing is important, because it's a novel that explores the Israeli-Palestinian conflict. 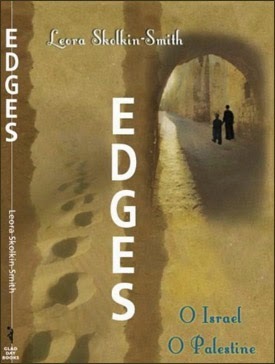 Edges was nominated for the 2006 PEN/Faulkner Award and The PEN/Ernest Hemingway Award by Grace Paley; a National Women Studies Association Conference Selection; a Bloomsbury Review Pick, 2006: “Favorite Books of the Last 25 Years”; a Jewish Book Council Selection, 2005; and won the 2008 Earphones Award for an original audio production narrated by Tovah Feldshuh.Her other novel, Hystera was selected by Princeton University for their "The Fertile Crescent Moon: Women Writers Writing About their Past in the Middle East." It was also the winner of the 2012 USA Book Award and the 2012 Global E-Books Award, as well as a finalist in the International Book Awards and the National Indie Excellence Awards. I'm so honored to host Leora here! Thank you, Leora! 1. The writer Oscar Hijeulos said: “Edges is an elegantly written, quite moving novel that has a lot to say about love, identity, history and the meaning of nationality.” Can you explain why he chose those words to describe Edges? What I was trying for was to present Jerusalem to the reader through the eyes of a young woman whose mother’s grew up in Palestine, now vanishing, but never talked about it. After my character, Liana’s, father commits suicide she is left to this wild and fascinating mother who fought in the Jewish underground and who holds a very unknown past. The mother returns to Israel with her daughter after the father’s death. For the daughter, it began to feel that this young Israel and Palestine were coming of age at the same time she was and the geography and canvas of Jerusalem became a silent guide to how each was experiencing their growth, reflecting each other in interesting ways. The language of the body and nature is always important to me. The landscape became a story-teller all unto itself. What brings in the meaning of national identity and history is that the mother, though Jewish and part of a family that had been in Palestine for generations, can’t find her old home, Palestine when she returns, taking her daughter with her. The turbulent changes, the wars, the buried history of early Palestine is repeatedly held hostage to the border hostilities between Arab and Jew, and the effects of the formation of the state of Israel and all that came with that. So in a sense the mother is stateless. Identity for both mother and daughter had to be an internal one, sexual identity of the daughter was also confused by the lack of borders between her mother and herself, as boundry-less as the land itself. 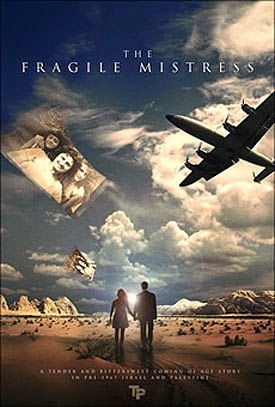 In this sense, I wanted to ask questions about nationality, identity, history and of course, love, as the bonds of mother are daughter are broken by the emergence of an American diplomats son into the story who take the daughter away from her mother. 2. I always want to know what generates a book for an author, so what inspired this one? For me, this novel was really the work of more than twenty-five years of failures. I could not understand how to write through my own personal experiences with Israel and Palestine, the conflicts I had with a troubled mother who was taken from Palestine to affluent New York and was an outsider there. But when the Persian Gulf Crisis broke out and the situation for the Palestinians and Israelis became severely inflamed, I felt had to integrate all I had heard as a child, if only for myself. The drive was there all along, though when I was taken as a young child to such a mysterious and often frightening country as Israel was back then. But when the Persian Gulf Crisis happened, I felt more urgency for some reason. I don’t think I’m a political person, so that wasn’t it. It was that I was witnessing the erasure of a whole tribe of people virtually forgotten as history rang its self-righteous bells. One doesn’t read much about Palestinian Jews, so I felt like was working from blanks in my own education too but not in my sensual and very real memory banks which held all those family stories of early Palestine vital and sensually alive for me. 3. After all critical attention Edges won (and I understand Grace Paley nominated it for the prestigious PEN/Faulkner award) was it difficult to write the next book or did it make it easier? Did you find that the whole process of writing the book was different somehow, and if so, how? Yes! It was terrible. I really didn’t have another book to go to! It was hard when Grace died because I lost all that stalwart support, I felt lost in some forest of others who scared and intimidated me without Grace. But now, ten years later I’m finishing my new novel and pleased. 4. You worked closely with Grace Paley. Tell us a little bit about what that was like. I wrote an essay about her for the Quarterly Review a few years back, after she died. I think it told what I knew of her as the writer. It was called “The Legacy of Grace Paley”. What I most remember about her personal is her vaudevillian sense of things. She could make the world's horrors and your own grimest moments, all the dark places luminous, and jokes weren’t just jokes, but a power to not feel like a leaf in the wind, thrown to the world’s chaos. Humor was very important to her. And she was quite a vaudevillian, a real performer. Everything was for the work of either living, working or writing, just that you came by things honestly. Grace, she could turn words into a flip and make them tumble around. She was a tumbling expert I always thought. There were also many Interruptions whenever I visited her but then she made the interruptions seem fascinating. She was a woman who wrote about women’s lives, ordinary lives, she wasn’t interested in the famous, and she was among the first to ever reveal women’s lusts, inner lives, feelings about family obligations and dailiness with such a clear eye. And no one wanted to read such stories before Grace! Much more. There will always be much more to say about Grace. 5. What's your writing life like? How do you plan your books, or do you? I’m all over the place, I write doing the dishes. I write when I’m supposed at a social gathering and paying attention. But I have absolutely no routine. 5. What’s obsessing you now and why? None, and thank Caroline for having me! 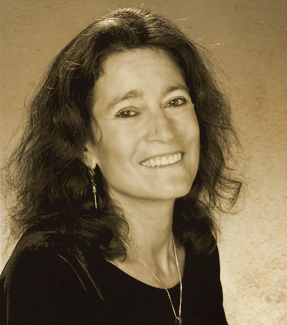 Amy Impellizzeri knows the terrors of being a first novelist, and she's written a wonderful essay about dealing with them. Her first novel Lemongrass Hope was called a "layered, bittersweet romance" by the notoriously cranky Kirkus Reviews, and New York Times bestselling author, Jacquelyn Mitchard called it "a truly new story. Impellizzeri is a bold and tender writer, who makes the impossible feel not only real, but strangely familiar." 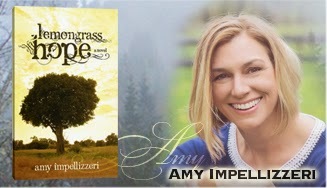 Lemongrass Hope, about love, time travel, and what lasts, is haunting, mesmerizing and unforgettable. Thanks for writing an essay for the blog, Amy! I was sitting on my bedroom floor with the pages of what would later become my first novel strewn all over the place like they were auditioning as a new carpet. On any given day, I loved them and I hated them. But on that day, I hated them. They were staring at me like lost children. Like I should somehow be the one in control. Like I should know. Taunting me with their mistaken uses of lay/lain. With their “something is not quite right here with the structure of your story” – they chided me petulantly and I rubbed my eyes, as I thought about how easy it would be to just.give.up. We went on like that, day after day, week after week, month after month. The pages and I. No – the words and I. A dance for control. We got into each other’s heads. We danced some more. Got into each other’s heads some more. I started to believe something about the pages – about the words. The end. It’s the end that’s bothering me. The end was haunting me. One night I woke from a dead sleep at 2 am, and I wrote and wrote as if I was possessed. For weeks and then months, I wrote, and re-wrote and edited. The words and I danced and I no longer even tried tried to control them. I let them take shape. The way they wanted. The story unfolded in ways I never realized it could. It was at that point - oddly enough – that the end stopped haunting me. I wrote and wrote, and re-wrote and edited. I left the end alone. Because I realized that it was the beginning that had been haunting me all along. Yet, despite her words, her assurances, and the fact that the novel has been sent to print, I’m still haunted. I write more words, and I sit with them on my bedroom floor, pages strewn all over the place like they are auditioning as a new carpet. I love them and I hate them. They are the beginning of something new, and I am starting to realize that the beginning will always be what haunts me. Because when you write – when you have to write, of course, - there is no end.